Pearl Izumi's Elite Thermal Wool Sock uses a 67% Merino Wool blend and a tall cuff for battling cold weather. You can wear this sock well into the winter thanks to its warmth-retaining properties even when wet, and the extra Merino in the heel and toe areas creates additional comfort without bulking up the sock. Anatomic arch compression provides a performance fit, and the flat-seam toe ensures maximum comfort. 21.5 cm (8.4 inch) cuff. 67% Merino Wool, 30% nylon, 3% elastane. 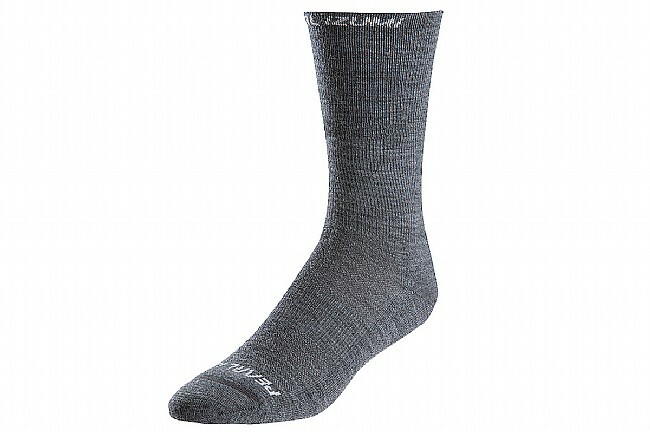 I have four pairs of these sock and they are unbeatable in cold weather. I've been wearing these during the winter and I'm pleased with the warmth and thickness of the sock. Good value for the price.